See smiles all around when you make these Creamy Poblano Strips. 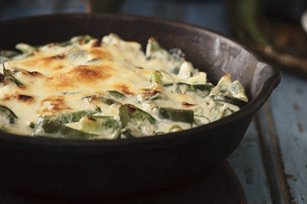 Creamy Poblano Strips taste great when served with cooked chicken, pork or beef. Blend milk, cream cheese, garlic and bouillon cube in blender 1 min. or until smooth; set aside. Heat oil in large skillet on medium-high heat. Add chiles and onions; cook 5 min. or until onions are tender, stirring frequently. Stir in cream cheese mixture; simmer on medium-low heat 5 min. or until heated through, stirring frequently. Top with mozzarella; cover. Cook 1 min. or until melted. Serve over grilled chicken breasts. Or use as a meatless filling for enchiladas.